The client is using an SMB URL to access an image of a Pembrokeshire Welsh Corgi playing in the snow. The URL is translated into UNC format for use with the SMB protocol. 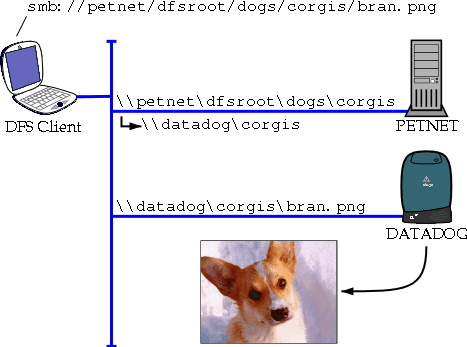 The server traverses the UNC path until it reaches corgis, which is a link to a share on a different server. The client is redirected to the new server, where it finally finds the file it wanted.